Snuggle Sac – the genius sleeping solution! I first heard about Snuggle Sac when the nursery asked me to purchase one. The little man had been sleeping in the cot at nursery for his naps, but he was moving up to the next room and they no longer used cots. ‘Uh-oh’ were my first thoughts…… he’d always slept in a cot – how was he ever going to adjust to sleeping in the Snuggle Sac? Good luck to the nursery staff I thought…… GOOD LUCK! When it first arrived, I was pleasantly surprised – I was just expecting a sleeping bag, but it was softest, prettiest sleeping bag I had ever seen (I secretly wanted it!). I also loved the fact it came in its own bag so could be easily transported. I was absolutely gutted to give it up and send it to nursery with him. The next day was D day – no more COT! I prayed that he wasn’t going to be too much hard work for the staff at the nursery, and hence was quite nervous when I went to collect him at 5pm. BUT, I needn’t have worried – he slept in it first time – for TWO HOURS! I didn’t believe it, and thought it must have been a fluke. And then he did the same the next day! Apparently all he needed was a bit of patting, and he slept when all of the other toddlers slept. I was completely intrigued how the Snuggle Sac was working so well (and they’d even managed to get rid of his dummy!) – so I was over the moon when Tina sent me a second Snuggle Sac for use at home. 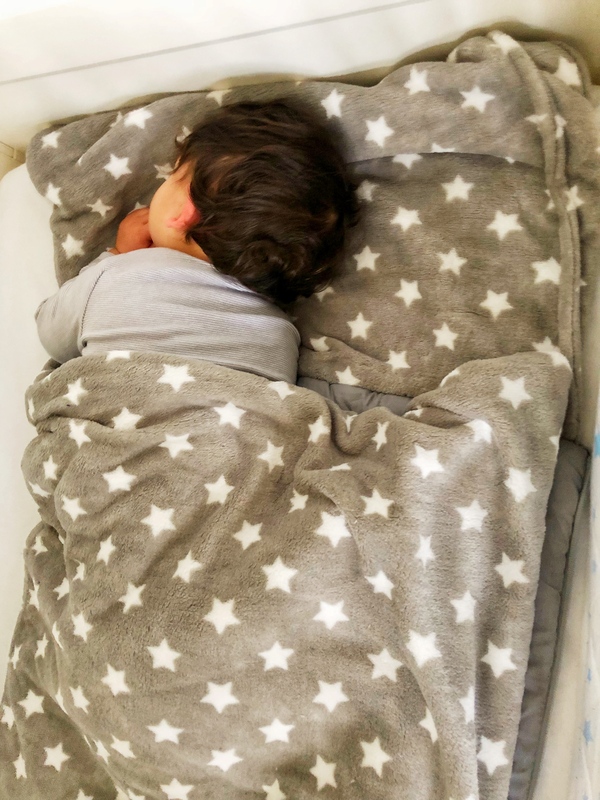 For the past few months I have struggled to get him to sleep for his naps at the weekend – and the transition into the cot after he had fallen asleep in my arms was getting harder and harder. So, I was very pleasantly surprised when I used it at home, and found that he happily snuggled up into it without waking up. And, for the first time in ages, he slept for nearly 2 hours ON A WEEKEND! The Snuggle Sac has been great for naps, and as it is so compact, with its own bag, it means I can transport it with me easily. Brilliant when we are visiting people for day trips. The reason I think it works so well? Because the 100% cotton material makes it so warm and cosy, which makes it so easy to put him down into without him being too shocked by the temperature change. We wouldn’t want to be put down onto a cold sheet when asleep either! I can’t wait to take it on holiday with us, and i’ve been told it’s brilliant for helping the transition from cot to bed – so I think i’ll have lots of uses for it in the coming years. The Snuggle Sac comes with a slot for a pillow, and I think it’s going to be a big help when transitioning from his Grobag to a big boy bed with a duvet. 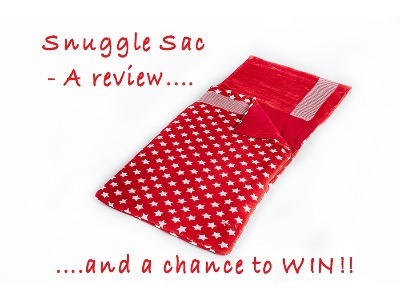 I’m delighted to announce that the lovely Tina, creator of the Snuggle Sac has agreed to a giveaway! This is your opportunity to WIN a toddler Snuggle Sac of your choosing (where available). Competition is open to UK residents only from 21st February until 9th March. The winner will be notified via email within 7 days of the competition closing. The decision of the blog will be final. No purchase necessary. Entrants must be aged 18 years or over. All prizes must be accepted as offered. There will be no alternative awards, cash or otherwise. Anyone identified as using multiple accounts to gain extra entries will be disqualified. If you enter by following an account you must still be following when the the giveaway is drawn. I was sent a Snuggle Sac for the purpose of this review, after purchasing one initially. All opinions are my own. Perfect for my toddler Freya. I have been looking for something like this for Day time naps for a while. It’s perfect. This is lovely and would lead to so many peaceful nights. These are the perfect item for little ones to sleep in. Would love to try this with my newborn! Snuggle Sacs look so comfy. I would love this for my little boy! Fab prize! Would love for my Little girl! Absolutely brilliant for both of those things! Good luck! It’s great – good luck! So soft, I want one! Oh we have one of these, ours is a fairy tho. It’s probably one of the best things we purchased. Perfect for holidays and staying over somewhere. Thank you so much for linking up with #kcacols and we hope to see you next time. Here’s how I saved £1000 in 4 weeks!